Interests - Playing with cars, trains and action figures! Scooby Doo. He like colouring and crafty stuff - sticking and cutting. Football is also a BIG favourite, as is any other sport. 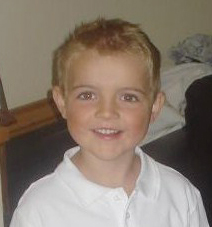 Jacob was diagnosed with ALL on 13th April 2005. He had been off colour for a few days and it was quickly diagnosed after a blood test. We had an initial 10 day stay in hospital and he started 3yrs of treatment after 6 days. By day 8 he was in remission which was more than we could ever have hoped for. He was however rather poorly for about 5 weeks and put on 11lbs in weight because of the steroids he had to take. At present he is in interim maintenance, which is quite an ‘easy’ time and he has even managed to do sessions at playgroup as his blood counts were good. In just under a month he will start his first intensive treatment block and we are nervous as we do not know how he will be and how the chemo will affect him and if he’ll lose his hair or not. As he is only 3, Jacob does not understand the ins & outs of his illness, but he knows he is unwell and has to take daily medicine (which he does with no moans). He also has a Hickman line(aka Mr Wiggly) for his bloods to be taken through and medicine to be administered. He is fantastic about this and the only problem we have over all this is when the dressings need changing – he hates it. However, he is quite proud of Wiggly and shows him off to unsuspecting people now & again! We try to keep life as normal as possible for Jacob and treat him as we always have. Sometimes he is unable to go into public places or see friends as his blood counts are low, but he has his little sister to play with and luckily they get on well. He’s a brave little boy and a total hero in a lot of people’s eyes. So, it’s all finished. Well, kind of! Jacob still needs to take his septrim for another 3 months and we still have monthly check ups at the hospital, but in essence it is all over. To highlight the point, we had to take Jacob to A&E a couple of weeks ago as he hurt his ankle. No fast track into a room this time, we had to wait with the rest of the rabble – we were treated normally! We had a lovely family party on the 14th June and we all witnessed Jacob take his last dose of 6MP – he and I pushed the plunger on the syringe together. Of course I got emotional and wanted to hug him, but he ran straight back onto the bouncy castle! It’s been a long journey, although I still remember the first day as if it were yesterday. I hope and pray that this is the end of it all, but I know that if it’s not, we’ll just do it all again – whatever it takes. Sadly, Henry’s stem cells were not a match, but I am confident that we wouldn’t have ever needed them anyway. I am hopeful they can be used for research or even a donor bank. I am waiting to hear from the blood service on that. I feel that Jacob should now go to the moved on section. He and Louise have been so lucky with all the postie they have received over the years, but I feel now is a good time to move on. I hope I can still send the odd update though. Thank you to everyone that has ever sent a smile, a postcard, a letter, a gift. Each one was met with a smile. People are so kind; one of the positives of dealing with childhood cancer is the realisation that human kindness still exists. And it is much appreciated, from all of us. Jacob is really well, and at the time of writing this, has just 11 days of treatment left! D Day is the 14th June. He had his last vincristine nearly 2 weeks ago, followed by his last course of steroids (hurray!). Today is his last LP. Suddenly it all seems to be upon us so quickly and it’s a very strange feeling. We are having a family party on the 14th, the bouncy castle is booked and the fireworks bought! We plan to celebrate in a big way. In some ways it’s an anticlimax as there will still be septrim to give and appointments to attend, but no more actual chemo, what a huge thing! Jacob finally has a wobbly tooth at the grand age of 6 and a half! He is excited today as he can finally answer yes to ‘any wobbly teeth?’ that the anesthetist always asks him! He, Louise and Henry have had some lovely things through the post, thank you to everyone. Kate, the dodgy jokes are a big hit and they dissolve into giggles every time they tell them! Derek the dog sent a lovely letter yesterday, with origami which Louise is amazed by! The Hulk was taken to bed to cuddle! Jacob has a new baby brother! Henry James was born on 16th March weighing 8lb 13oz, exactly the same as his big brother! It was a smooth and quick labour and the stem cells were successfully collected by our lovely midwife who was terrified she would muck it up! Hopefully we will never need them, but they are good to have. Jacob and Louise are both very impressed with Henry and are being very good with him. Jacob had vincristine 2 weeks ago and it was fine, but unfortunately his trusty vein that never lets him down has packed up! We have to use the other hand now. So, we came out thinking how wonderful it was that he only has 2 more lots to go and thinking we were on a clear home stretch and then he spikes a temperature on Monday (1st day of Easter holidays) and he has been on the ward since then. Not sure what we are dealing with yet, as we’re waiting for cultures to come back. There is a slight crackle on his chest and he has sore looking ears. He was pretty poorly for a couple of days, but it much improved today. He and Lou continue to enjoy all the post they receive and they, and I, really appreciate it. Thank you everyone for your continued support. Both kids get so excited when the post lady comes! Jacob continues to do well; in fact he has done fantastically well. He had vincristine last Thursday; we think there are only 4 more to go now, an amazing thought! They are very excited about the baby’s imminent arrival, it’s very hard not to be able to give them an actual date, but they know it is soon! I hope it is very soon! I didn’t seem to get a chance to update in January, as for a month that usually drags, I don’t know where it went! Firstly, a huge thank you for all the Christmas gifts the children received, as well as all the cards and letters. Louise adored the cards from the reindeer and got so excited every time one arrived! We had a lovely Christmas – tiring, but lovely. Jacob did spend 3 nights on the ward in December with a high temperature and what we think was a virus, so he had an extended Christmas break from school! He also seems to suffer more after each vincristine now, so has had a few days off with that too. He’s doing well though, and is generally in fine form! So now we’re in 2008, a huge year for us! A new baby in the spring, and then in June, what we’ve been striving towards – the end of treatment. We greeted the New Year with a mixture of nerves, excitement, emotion and anticipation. One thing is for sure, we will keep smiling. Jacob continues to be well; it really is hard to believe all he has been through sometimes which is the best way to be we think! He and Louise are excited about the baby, although it’s hard to convey the time scale to them and that there’s still 4 months to go! Jacob is asking lots of questions about it too, some are a little involved, I may have to get a book!! He has had some birthday gifts/cards through the post, although obviously has not opened them yet, he’s waiting until Sunday, but thanks to the senders in advance! He’s also had the first flurry of Christmas cards, where has this year gone? It’s hard to believe that 6 yrs ago we were awaiting the arrival of our first child, and he was already one day late. He only made us wait 2 more days though! What a lot he has had to endure in those short years, but what a boy eh!? I knew he was one in a million the first time I held him; he’s proved that over and over. Jacob is really well. He is loving school and seems to much prefer Year 1 to reception; I think he enjoys the ‘proper’ work! He is getting loads of stickers on his star chart there and had a celebration service last week for his hard work on a story he wrote. I know that any parent would be proud to watch their child get an award, but sitting in the school hall and knowing what he has been through, make it an even more special moment. He had vincristine this week, so we are currently enjoying the joys of steroids! But the good news is his appointments for vincristine fall just right to avoid his Birthday next month, and Christmas too – hurray! His treatment certainly seems to be going to plan, and we’re lucky that we have only needed to go to hospital for scheduled appointments for a good few months now. Thank you for all the post this last month, mostly Halloween themed which was met with much excitement! Jacob is very well. He has settled right back into school and bar a cold, has been in good health. He has his next vincristine shot next week and then an LP 2 weeks after that. Oh, and we got an end date – 14th June 2008. Wow! Thank you Julie for the Paradise Park pencil and the letter. Thanks to Karen, your cards still make the kids smile. Thank you to the ‘well wisher’ for the stamp collection pack and sparkle pencils, both have been a huge hit. Sorry for the lack of updates lately, the summer holidays were a bit mad and went far too quickly! Jacob is very well. We managed to avoid any unscheduled hospital trips throughout the summer, so that was a huge bonus. We had a lovely holiday in N Devon and it was lovely to see Jacob in the sea and swimming pool, something he couldn’t do last year. He is a bit of a surfer dude and enjoyed body boarding! He has gone back to school into Year 1 and has that ‘I’m not the littlest anymore’ swagger! He’s really enjoying it. Louise is back at playgroup and is enjoying that too. It was lovely to see them playing over the summer, they get on so well. Jacob’s dad ran the Bristol half marathon on Sunday and we are all so proud of him. He ran in aid of CLIC (www.justgiving.com/mattyhicks). Thank you for all the gifts and postcards, each one is still so very much appreciated. Oh, and one last little bit of news. All being well, Jacob and Louise will have a new brother or sister next March. They are very excited… for the moment!! Jacob continues to do well. He has now finished his reception year at school which we are so proud of. He had his ‘report’ and has done really well. He only missed about 10 days through illness, so that far exceeded our expectations! He is now on summer holidays along with his sister Louise, so we have a lot of fun (!?) to look forward to! They have been sent some fantastic activity books and activities as posty though, so at least we have things to fill the time! Thank you to Karen, the football wordsearch was a huge hit; it kept Jacob busy for ages! He has also loved looking at the different stamps from around the world! Jacob has received some fantastic goodies this month, as has Louise, so thank you to everyone who is kind enough to think of us. My PC has been a bit poorly, and I have lost Ms Marcene’s email address, please could you mail me Ms Marcene? Many thanks to everyone for your continued support. Jacob spent his half term in hospital! He spiked a temperature on the Monday and we were allowed out on Friday. We think it was viral, but they kept spiking, so they wanted to make sure. He was great at having the canula put in and it lasted all week which was great. I’ve kept him off school today, and will let him go back once I know his bloods have bounced back. He is really enjoying football, but sadly, he missed football camp in half term. I’m sure there’ll be other chances though. His little sister Louise was sad he was not around, I think it’s getting harder on her the older she gets. Other than that blip, Jacob is just fine. A real typical 5 year old boy!! April saw 48 hours on the ward with a high temperature. Our first stay in 6 months so can’t be bad! It came a week before the 2 year anniversary of Jacob’s diagnosis, and it almost seemed apt. Just a little poke – a gentle reminder that we’re still on this journey. Jacob was fine within a couple of hours of arriving at the hospital, of course, so it was 48 hours of keeping him amused! His bloods dipped and he was off oral chemo for a couple of weeks, but he’s been on 100% since January, so not too bad. He’s back on it now. He was fantastic with his last vincristine shot; he was so good with the canula. And then yesterday he had his LP and he chose the canula over the mask (as he doesn’t like the taste of the mask!) and again, he was as good as gold. We’re so proud of him. So a funny month, but Jacob is fit & well. He starts football club later today and is *so* excited! Jacob is still doing well. His bloods have been consistently high since 12th Jan now, so I am expecting them to up his dose of 6MP. He was presented with an award in his school service last week for hard work; I was very proud and it was lovely to watch. We had a bit of an odd week as Jacob’s dad’s car was stolen from our driveway on Tuesday and a window was smashed on my car. Annoying as it is, we both know it’s not the end of the world, serious illness gives a very clear perception on life! But, to make up for that, exciting news! We got a puppy yesterday and she is called Maggie! We’ve been visiting her since she was 5 days old, and she is now 8 weeks. She’s a black working cocker spaniel and the kids are besotted, as are we – she’s very cute!! Thank you to Karen for the cat cards, both kids think they are hilarious and they love hearing about your exploits, I think you are fantastic for doing it so regularly. And Julie B too, your cards are always appreciated! Jacob is doing great. He is looking great and feeling great. He has been so grown up with all his GA, thumb pricks and butterfly canulas. He does them all with no fuss at all now and I don’t even have to go into school when the CLIC nurse comes now, he does it all on his own. Not bad for a 5 year old! We are all immensely proud of him. Thank you for all the cards, notes and gifts that people send to both Jacob & Louise, they are all met with a big smile. Jacob has missed just over a week of school due to low bloods, but he has gone back this week. He spent a night in hospital too, with a temperature spike, but we were lucky to escape in less than 24hrs! He had his vincristine shot yesterday and the steroids have already kicked in! It’s his Birthday tomorrow, and I doubt anyone else will get a look in with his cake!!! Thank you for all the gifts that have arrived ready for the big day, they are all hidden under my bed!! Jacob continues to do well without wiggly. His bloods have been good for 2 straight months now, which of course means he has managed 100% maintenance for all that time, which is good. He is being very brave for the thumb pricks and canulas he has to endure. Thank you for all the Halloween goodies and the CDs for Louise. The parcel from America was fab, the Scooby stickers and stapers went down a treat. Jacob is doing really well. I think the removal of his wiggly was a blessing in disguise. He is coping well with thumb pricks and canulas and his bloods have been sky high and keeping that way. He is like a new little boy, so much more confident and best of all, we can all go swimming which we all love. Thank you as ever for all the post. Louise has been really excited to receive mail too; she loves to rip open envelopes! Jacob came out of hospital on Thursday – hurray! Wiggly had to go in the end, but he’ll get a new one soon. Jacob broke his elbow yesterday; he stood on top of and fell off of one of those tiny toddler slides. He was not a happy chappy during the exam, x-ray or plastering, but is fine now and doesn’t seem to be in pain and is adapting to being left handed already. So, we got to see a whole new department at the hospital, it made a bit of a change! Jacob ended up back in hospital ‘again’ last week for 2 nights with another high temperature, so lots more antibiotics were needed. It had to be one of the hardest stays for me; there were lots of newly diagnosed children which is very distressing. Then I got ill too and ran a fever which knocked me for six. His bloods miraculously came up though. He has re-started on the chemo and he has been back at playgroup this week. Not quite the holiday we planned. We got Jacob out of Bristol children’s hospital on Saturday and set off on holiday on Monday at about 11am. By 2pm he was settled into a ward in Barnstaple hospital as he spiked a temperature and was unwell on the way down. So, he ended up in there until late Wednesday evening. We had to take him in Thursday and Friday for IV antibiotics too, each one taking about 2 hours. We were meant to come home Friday, but booked into a Travel Inn that night to extend it a bit. Jacob’s been on the ward since yesterday morning after he spiked a high temperature. He hadn’t been quite right for a few days and as we are going on holiday next week to Devon, we wanted to get it sorted. Jacob had a lumbar puncture last week and was a really good boy; he really showed how much he had grown up since his last one, 12 weeks ago. We are so very proud of him. His bloods had dropped a bit last week, but the CLIC nurse has been today, so we are hoping they will have risen a bit. I am doing the Race for Life on Sunday 14th May and poor Jacob is a bit disillusioned I think, as he keeps asking me if I’ll win the race!! Thank you again for all the post that Jacob receives. All the crafty Easter activities went down a storm with him & his sister, Louise. Went to check on Jacob on Friday night before I went to bed and realised he was red hot. Cue 48hrs on the ward! We think it was just a cold/virus as no tests came back with anything nasty. Jacob is doing really well, his bloods seem nice & stable and he is full of energy. We met with the consultant a couple of weeks back and it was all very positive and it seems Jacob is doing as well as they can ever hope for. Nothing is ever certain, but we hang onto those positives. Thank you to everyone for your continued support for Jacob. He still gets so excited with every bit of post he receives! We are very grateful to you all. Jacob spent 48hrs on the ward, Friday – Sunday. He spiked a couple of high temps, but all seems to be well and his cultures came back clear, so just got to keep an eye on him. His bloods have dropped though, so no playgroup. CLIC nurse coming today, hope they’ve gone up. We saw a consultant last week to get an update on Jacob’s progress. To cut a long story short, he is dong as well as can be expected and they are very pleased with how it’s all going/gone. If we can get him to 5yrs post treatment (7yrs time) without it coming back, his long term prognosis is very good. Jacob is very well in himself; his hair is growing back and is so soft – adorable. He is back at playgroup and loves it. He has his bloods done once a week and touch wood, we shouldn’t have to go back to hospital until 23/03, we will have had 4wks off. After 14 Lumbar punctures, 4 shots of aspariginaise, 6 infusions on doxorubicin, 2 infusions of cyclophosphamide, 16 shots of cytarabine, 14 shots of vincristine, countless tablets, endless medicines, 2 different central lines and 34 nights in hosptial – Jacob has finished his intensive treatment today. He is in still in remission and everything is going to plan. We still have a long way to go, we are currently on week 37 and treatment ends at the end of week 164. There are many more medicines to take, and lots more drugs to be administered, plus an LP every 3 months, but we should be at the hospital a whole lot less. It feels great, it really does. We are so proud of him and how he has coped, he’s a true hero. Jacob had a tough couple of weeks leading up to Christmas, with 2 separate stays in hospital. Touch wood, normal life has now resumed though. Thank you for all the wonderful cards. The ones from the reindeer made us chuckle every time! Thank you to everyone who sent Jacob a gift aswell. Each one was much appreciated and caused a lot of excitement. I will be sending individual thank yous as soon as I am able, but please know how grateful we are. We’re continued to be amazed with people’s kindness. Have a bit of time to update as we are stuck in hospital again. Jacob spiked a temperature on Sunday and we have been here ever since. He was sick Monday night and his temp spiked again, but has been stable since then. His bloods are really low, but he still had his chemo earlier (2wks into Delayed Intensification II). None of the cultures have grown anything, so we think it’s probably a viral thing, but with his history of line infections, we want to cover all bases. Really hoping to get out this weekend. Jacob has a new wiggly that all went well and he is very accepting of it. He starts delayed intensification on 30/11, so we will be jumping back on the treatment rollercoaster. Jacob is very well though and has been attending playgroup as well as keeping us on our toes! Thanks to everyone who sends a smile, every one is appreciated, it really is. Well, after being told Jacob could come home Monday, not Friday, it all changed again and he did end up in there until Friday. They decided that he needed to stay on the IV antibiotics as they did not think the oral ones would be sufficient. We were allowed to bring him home for most of the day, and the last 2 days we were allowed out from breakfast time to bedtime, with the CLIC nurse coming out to give him meds. Still a hard slog though, and I’m glad it’s over. We actually ended up in there the same amount of time as when he was diagnosed. Only person not pleased however, is Jacob. He’s totally institutionalised and I had to drag him out of there every day and then he spent all day asking to go back. When we were discharged, he said “I know, I can move my bed in here”. He is so well, you wouldn’t know there was anything wrong. Bloods have fallen though, so all oral chemo is suspended as we are going away tomorrow for 3 nights and they didn’t want to risk him getting ill when we are away. Jacob is on Maintenance for 8 weeks with only 2 scheduled hopsital visits! His blood counts are currently the best they have been. Jacobs dad is having surgery on his leg later in the month. Thank you again for everything that you have sent for Jacob, every single one makes him and us smile and we are very appreciative. Jacob finally finished his intensive chemo last week. We are just waiting for his blood counts to rise and then he can go back to playgroup. He is really well and full of energy. Jacob had a lot done yesterday – chemo, antibiotics and a lumbar puncture. He was sick all evening, and I mean *really* sick, was just bringing up bile. We had to take him to A&E where they gave him some meds which worked instantly. We got in at 11.30pm last night. Took him back again this morning for more chemo and antibiotics. Very very tired. Jacob is fine just like it never happened!? Well, after 5 nights in hospital we’re finally home. The infection should clear up with the antibiotics, and he is certainly very well and back to his normal self. We were discharged at 1pm, but Matt has just taken him back as he needs his next antibiotic at 6pm, they do it on a slow driver. I then have to take him in every day until Thursday for the rest of the course. His counts are good enough to begin the next bit of chemo too. So, on Tuesday he will have a Lumbar puncture and the spinal chemo, and another chemo which will be infused over 4 hrs. Then we go back Weds for a different one again, but this is just a push through wiggly. He then has this one for a further 3 days. Then, next week, it follows that pattern again, but without the 4hr one. Just wanted to let you know that Jacob is in hospital with a line infection, he’s been in since Tuesday night and we will find out today when he will be able to get out. He’s a lot happier in himself today after being quite miserable for a few days, so he’s on the mend. Thank you so much to everyone who has sent Jacob (& Louise) something through postpals. Jacob gets so excited when the postlady comes and Matt & I are both overwhelmed at how kind people are, because they really do make our little boy smile. I hope to be able to reply to everyone one day. Jacob is doing well on his intensive treatment block so far. He has not had any adverse reactions to the new drugs so far and is well in himself. The steroids have kicked in and he is eating more than usual and has got a ‘moon face’ again. He suffers from achy legs from time to time and often complains of a tummy ache, but is still as cheeky as ever. Jacob is starting an intensive chemo block. 3 x Lumbar punctures and spinal chemo (done under general). Had plenty of these before and no adverse reactions as yet. 3 x doxorubicin. IV chemo given over a 1 hr period. Never had this before. 3 x Vincristine. Had loads of this, makes his legs ache. 1 x Cyclophosphamide. IV chemo given over 4hrs. Never had this, likely to make his hair fall out. 8 x Cytrabine. IV push given in 2 four day bouts. Never had this. 2 week course of Thioguanine. Given orally. Never had this. It all kicks of with a general tomorrow for a lumbar puncture and a shot into his spine. Am hoping that he stays quite well, but don’t know how he will react to it all really. His counts will drop like a stone as all these drugs are immune suppressents, so we’ll be pretty housebound again, much like we were for the first couple of months.